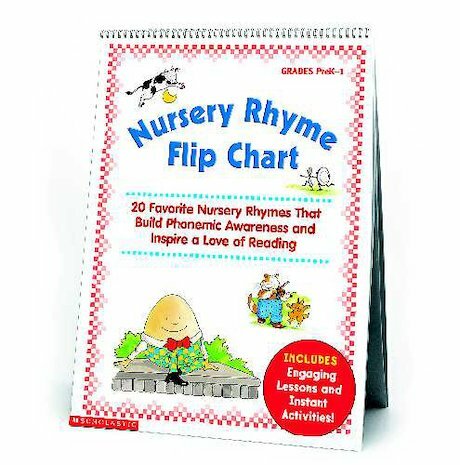 Building phonemic awareness is a joy with this BIG, laminated flip chart featuring 20 well-loved nursery rhymes! Teachers can turn to this sturdy, colorful resource every day to teach rhymes and word families, beginning and ending sounds, early reading skills, and more! Includes instant and engaging questions to build key phonemic awareness skills. Nursery rhymes include: Humpty Dumpty, Little Jack Horner, Little Boy Blue, Little Bo Peep, Hey Diddle Diddle, Pat-a-Cake, Old Mother Hubbard, Hickory Dickory Dock, The Old Woman Who Lived in a Shoe, Twinkle Twinkle, Mary Had a Little Lamb, Itsy Bitsy Spider, Little Miss Muffet, Hot Cross Buns and 1, 2, 3, 4, 5. Old King Cole For use with Grades PreK-1.